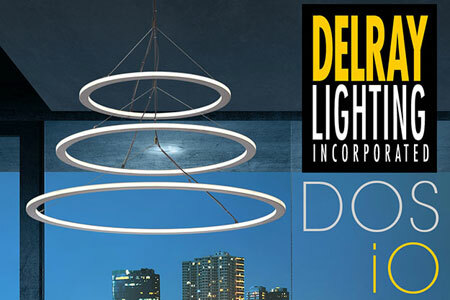 Delray’s popular Dos line of direct/indirect circular LED fixtures has gone in/out (iO). Like the original Dos, these 3, 4 and 5 ft. fixtures are comprised of an extruded aluminum outer housing, with inside and outside frosted acrylic lenses. White LEDs are 90 CRI Nichia tight bin chips on aluminumclad boards, available in 3000, 3500 and 4000º color temperatures. Standard drivers are programmable, constant current, 0–10V and dimmable to 1%. Custom reduced lumen outputs may be ordered, set at the factory. Color LED options include red and blue tape light, with two 12V constant voltage drivers; or Nichia custom RBG boards with two 100W, 24V constant current drivers and DMX interface. An optional wall mount control box is also available. Several mounting options are offered, with drivers either mounted in the canopy or remotely. The inside and outside LEDs may be separate-switched, and may be ordered with one color inside and a different color outside.